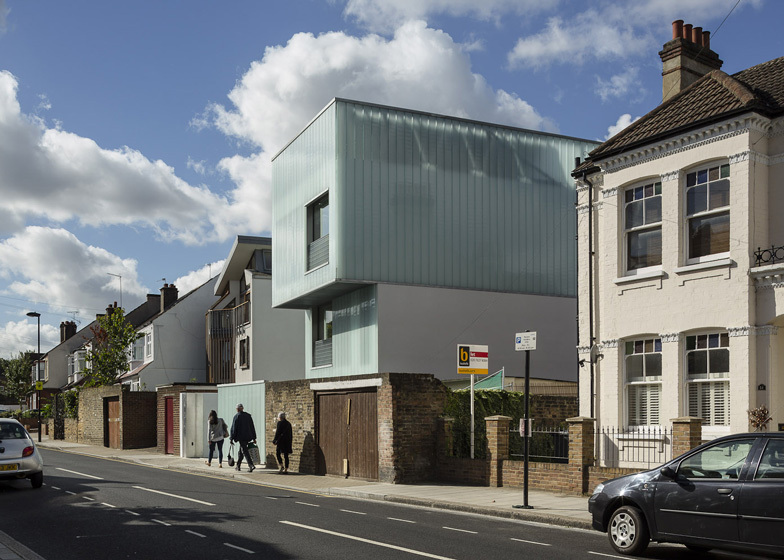 Planks of translucent glass provide the walls for this house in south London designed by architect Carl Turner for himself and his partner (+ slideshow). 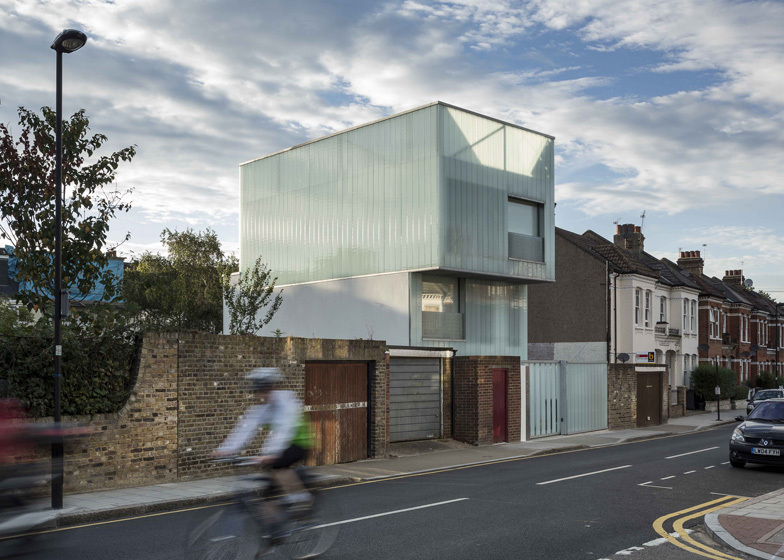 Positioned amongst a row of traditional Victorian houses, Slip House is a three-storey residence with staggered upper floors that cantilever towards the street. "We set out with a simple sculptural form of three cantilevered, or slipped, boxes," explained Turner. "The upper box houses our living space, the middle box houses sleeping and bathing, and the ground box is given over to a multi-purpose space, currently housing our studio." The translucent glass walls extend up to form a parapet around a terrace on the roof, and also surround a set of photovoltaic panels that generate electricity. Other sustainable features include a wildflower roof above the ground floor, a rain-water-harvesting system and a ground-sourced heat pump that generates energy. Inside the house, the ground floor studio features a moveable study area, comprising a combined desk and shelving unit attached to wheels. 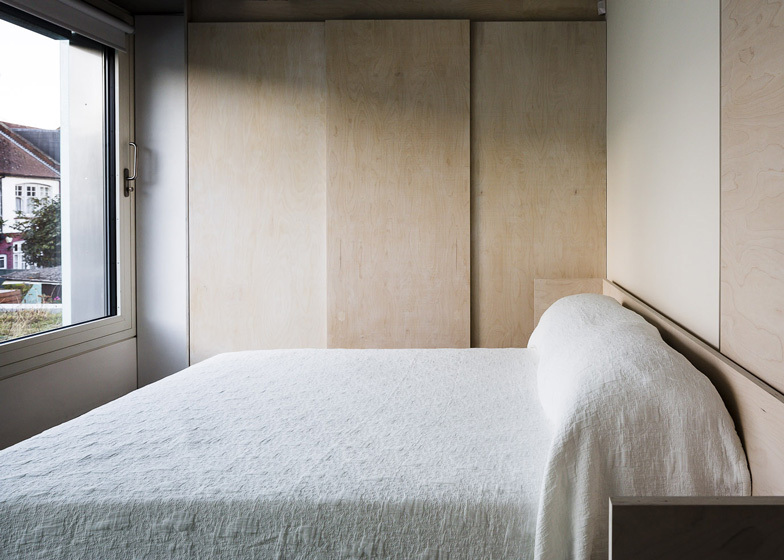 On the first and second floors, rooms are equipped with inbuilt storage walls, so residents can hide their belongings away behind plywood screens. 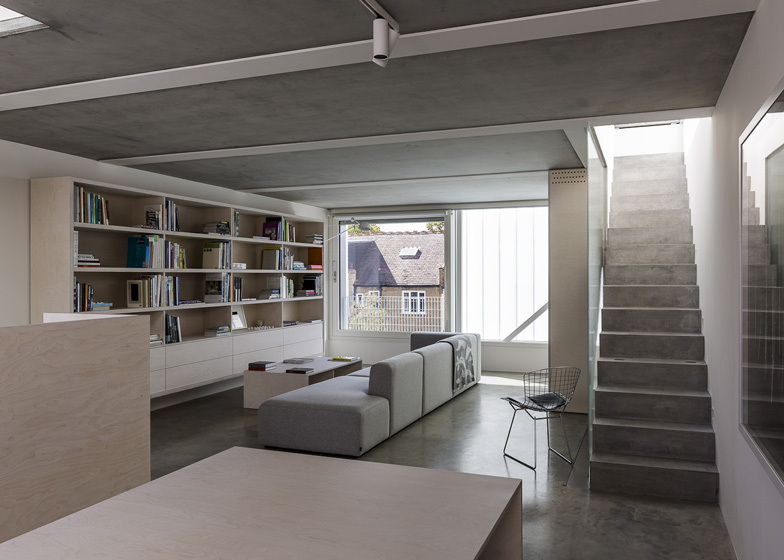 Floors throughout the house are concrete and sit flush against all the walls and fittings. 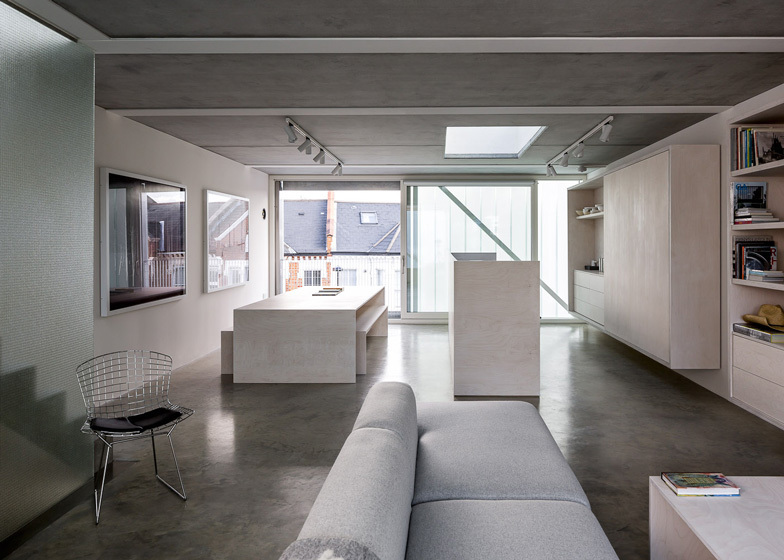 Another project we've featured by Carl Turner Architects is the extension to the couple's former home in Norfolk - see it here. Three simple ‘slipped’ orthogonal box forms break up the bulk of the building and give it its striking sculptural quality. The top floor is clad in milky, translucent glass planks, which continue past the roof deck to create a high level ‘sky garden’. Designed to Code for Sustainable Homes Level 5, it features ‘energy piles’ utilising a solar assisted ground source heat pump creating a thermal store beneath the building. PV’s, a wildflower roof, rain water harvesting, reduced water consumption, mechanical ventilation with heat recovery within an airtight envelope with massive levels of insulation make this one of the most energy efficient houses built in the UK. Living and working (‘Living over the shop’) is something that really interests us. 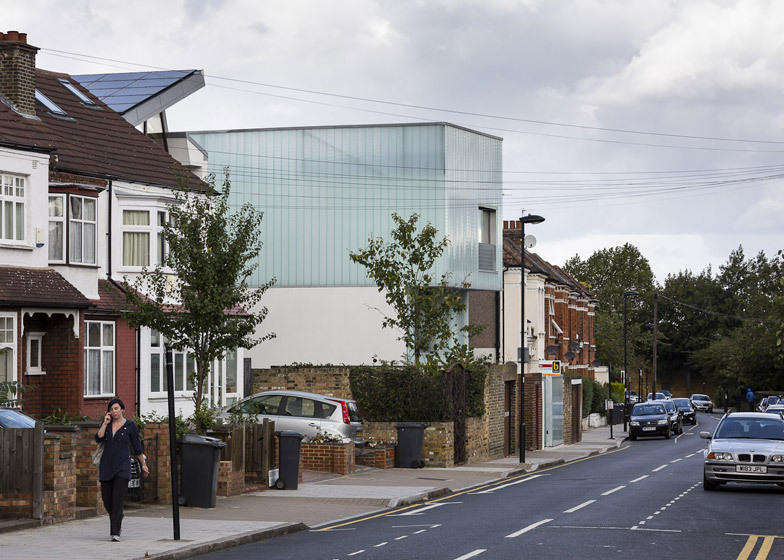 We see a prototype new ‘terraced’ house, squeezed into under-utilised city (Brownfield) sites. 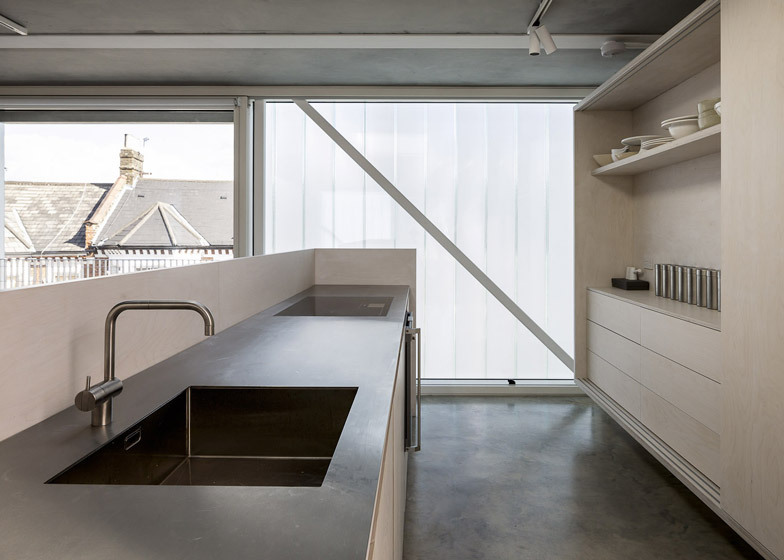 This flexible type of home can allow for the artisan or home-worker to sub-let or downsize. This can enliven local communities and produce ‘homes’ which create opportunities rather than be dormitories or financial assets. Slip House is flexible and can be used as a single home, studio workspace and apartment, or two apartments. Our approach was to model the building as a series of simple orthogonal box forms that use the full width of the site. This allows future buildings to simply adjoin the flank walls. The house takes the idea of three slipped boxes. 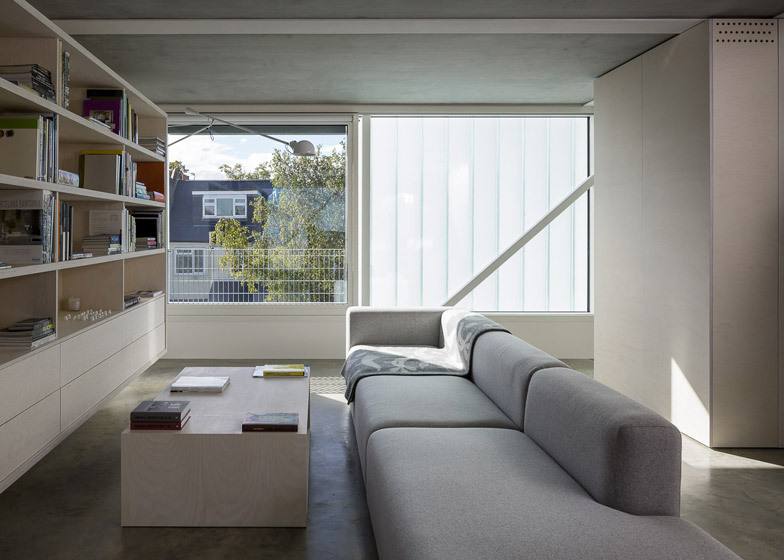 The boxes are carefully placed to maximise light and outlook from inside while not intruding on neighbour’s outlook. The shifting planes also break up the bulk of the building and give it its sculptural quality.